The latest roster includes ratings changes to a number of players. After scoring 26 points on 10-of-14 shooting against the Timberwolves, Aaron Brooks has received an increase in NBA 2K14 rising up to 77 overall. Also benefiting from the update are Terrence Jones (+1 to 65), Kawhi Leonard (+1 to 83), Victor Oladipo (+1 to 77), Jeff Adrien (+1 to 64), Tyler Zeller (+1 to 66), Sergey Karasev (+1 to 61), and Solomon Jones (+1 to 53). 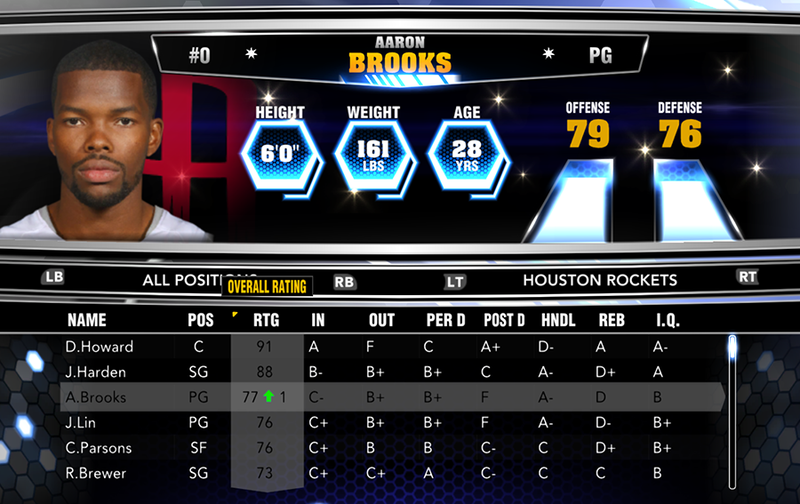 In addition to dynamic ratings update, many players have seen changes to their offensive and defensive attributes. On the other side, players taking a hit include Iman Shumpert (-1 to 81), Jamal Crawford (-1 to 79), Derrick Williams (-1 to 71), Al Horford (-1 to 81), and Jae Crowder (-1 to 65). Andre Iguodala, Marc Gasol and Derrick Rose remain active in this roster despite being listed as injured.